Today, Taylor Wimpey plc is an international housing, property and construction company, employing more than 4.000 people worldwide, with its headquarters in the High Wycombe/ Buckinghampshire (UK). 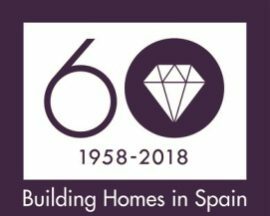 Taylor Wimpey de España has been operating in Spain since 1958, with a number of new and architecturally stunning developments on the Balearic Islands, the Costa Blanca and the Costa del Sol; all in prime locations. We have been dedicated to the construction industry for almost 100 years, since the day our founder, at the age of just 16 had the dream of building two houses in Blackpool, through to the present day. 16-year old Frank Taylor borrows £100 to build 2 houses in Blackpool. Too young to form his own company, his uncle Jack Woodrow lent his name to the business and ‘Taylor Woodrow’ was born. Frank Taylor made 100% profit on this first venture. Taylor Woodrow becomes a limited company with a capital of £3 million. Housing development begins in the USA and contracting activity starts. We now have 7 subsidiaries, 3 associate companies in the US. We look for new markets while continuing to build homes in the US. In London, Atlantic House is built – the first major reconstruction in the City of London since the bombing. We are now running over 250 projects around the world. Our new head office in Southall is finished. Work begins on Donnington Power Station, and Calder Hall Nuclear Power Station is completed. Taylor Woodrow is appointed as main contractor to build the New Metropolitan Cathedral of Christ the King at Liverpool. The St. Katherine’s Dock project beings in London: one of the most ambitious private urban development complexes ever undertaken in the city. We become a founder member of the Channel Tunnel consortium. Housing in Canada, Florida and California continues to develop. We continue our international investment strategy dedicated to developing our business in housing, property and construction. On 3rd July 2007, Taylor Woodrow plc and George Wimpey plc merged together to form Taylor Wimpey plc. 2012: For the first time Taylor Wimpey was ranked as a five-star builder by the Home Builders Federation using their independent National New Homes Survey. We maintained our five-star ranking in 2013. Today Taylor Wimpey is a FTSE Top 200 company, and one of the UK’s leading housing and development companies under Taylor Wimpey brand.